The wait is over for the video slots fans at the online casinos ran by Deckmedia. Fish Catch and Wu Zeitan slots are now live at four of the most popular casinos – Slotocash, Uptown Aces, Uptown Pokies and Fair Go. And as it is the tradition with such events – some free spins and bonuses become available with the debut of the video slots. For the Wu Zeitan fans, there is a 15 free spins bonus (no deposit required) with promo code AB-15-WUZETIAN, while with promo code AB-WU200-ZETIAN on can get not only the 15 free spins, but a 200% match bonus at any of the casinos mentioned above. The Wu Zeitan video slot is, as the name suggests, based on Chinese history, featuring the only female ruler with “heart like a serpent and a nature like a wolf”. A five-reel slot machine, it offers bonus when 3 or more consecutive Gongs appear, leading the player to an amazing feature selection set with plenty of free spins to deliver a massive win for the lucky gambler. 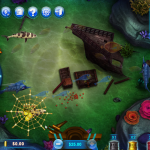 The Fish Catch game is an RTG-exclusive, and is one of the first multiplayer video slots, where one competes with other players, actual customers of the casino, catching as many fish as possible in the process and winning prizes and bonuses along the way, with the highest ranking players getting additional rewards, as well. This is bound to be one of the most exciting new ventures in online gambling, allowing features of multiplayer gaming to enter the gambling realm. Play these two new video slots at the casinos noted at the beginning of the article and try this new way of online gambling.